In a large saucepan add the coconut milk and fresh milk, together with the remaining ingredients and bring to a simmer. Add the corn and place the lid on the pan and allow to slowly simmer for 25 - 30 Minutes or until tender to your liking. 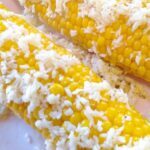 Serve on a plate and using a slotted spoon, scoop out some of the shredded coconut and arrange over the corn.